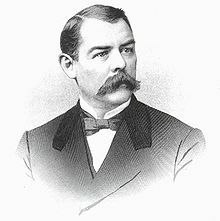 Albion Winegar Tourgée (May 2, 1838 – May 21, 1905) was an American soldier, Radical Republican, lawyer, writer, politician, and diplomat. A pioneer civil rights activist, he founded the National Citizens' Rights Association, established the historically black women's college Bennett College, and litigated for the plaintiff Homer Plessy in the famous segregation case Plessy v. Ferguson (1896). Historian Mark Elliott credits Tourgée with introducing the metaphor of "color-blind justice" into legal discourse. Historical marker in front of Albion Tourgée's boyhood home near Kingsville, Ohio; marker placed in May 2015. Born in rural Williamsfield, Ohio, on May 2, 1838, Tourgée was the son of farmer Valentine Tourgée and Louisa Emma Winegar. His mother died when he was five. He attended common schools in Ashtabula County and in Lee, Massachusetts, where he spent two years living with an uncle. Tourgée entered the University of Rochester in 1859. He showed no interest in politics until the university attempted to ban the Wide Awakes, a paramilitary campaign organization affiliated with the Republican Party. Tourgée took on the administration and succeeded in reaching a compromise with the University president. Due to lack of funds, he left the university in 1861 without attaining a degree. He taught school as a way to raise money to return to Rochester, but with the outbreak of the Civil War, in April of the same year, he enlisted in the 27th New York Volunteer Infantry before completing his collegiate studies. As was common practice at many universities at that time, Tourgée was awarded an A.B. degree in absentia in June 1862. Tourgée was wounded in the spine when he was accidentally struck by a Union gun carriage in the retreat from the First Battle of Bull Run, the first major battle of the war. He suffered temporary paralysis and a permanent back problem that plagued him for the rest of his life. Upon recovering sufficiently to resume his military career, he was commissioned as a first lieutenant in the 105th Ohio Volunteer Infantry. At the Battle of Perryville, he was again wounded. On January 21, 1863, Tourgée was captured near Murfreesboro, Tennessee and was held as a prisoner-of-war in Libby Prison in Richmond, Virginia, before his exchange on May 8, 1863. He resumed his duties and fought at the battles of Chickamauga and Chattanooga. Under pressure from the military because of his medical condition, Tourgée resigned his commission on December 6, 1863, and returned to Ohio. He married Emma Doiska Kilbourne, his childhood sweetheart, with whom he had one child. After the war, Tourgée returned to Ohio, where he studied law and gained entrance to the Ohio bar. The Tourgées soon moved to Greensboro, North Carolina, where he and his wife could live in a warmer climate better suited to his war injuries. While there, he established himself as a lawyer, farmer, and editor, working for the Republican newspaper the Union Registrar. In 1866, he attended the Convention of the Southern Loyalists, where he unsuccessfully attempted to push through a resolution for African American suffrage. An active participant as a Reconstruction Carpetbagger in his new home, Tourgée had a number of inspiring and harrowing experiences that gave him ample material and impetus for the writing he would later undertake. In 1868 he represented Guilford County at the state constitutional convention, which was dominated by Republicans. There, he successfully advocated for equal political and civil rights for all citizens; ending property qualifications for jury duty and officeholding; popular election of all state officers, including judges; free public education; abolition of whipping posts for those convicted of crimes; judicial reform; and uniform taxation. Nevertheless, he discovered that putting these reforms on paper did not translate into an ease of putting them into practice. Tourgée was elected to the 7th District superior court as a judge from 1868 to 1874, and he confronted the increasingly violent Ku Klux Klan, which was very powerful in his district and repeatedly threatened his life. During this time, Tourgée was also appointed as one of three commissioners in charge of codifying North Carolina’s previously dual law code system into one. The new codified civil procedures, at first stridently opposed by the state’s legal practitioners, proved in time the most flexible, and informal system in the Union. Among his other activities, he served as a delegate to the 1875 constitutional convention and ran a losing campaign for Congress in 1878. Albion's first literary endeavor was the novel Toinette, written while living in North Carolina between 1868 and 1869. It was not published until 1874 under the pseudonym "Henry Churton"; it was renamed A Royal Gentleman when it was republished in 1881. Financial success came in 1879 with the publication of A Fool's Errand, by One of the Fools, (Fords, Howard & Hulbert, Nov 1879) a novel based on his experiences of Reconstruction, which sold 200,000 copies. Its sequel, Bricks Without Straw, also was a bestseller. In 1881, Tourgée moved to Mayville, New York, near the Chautauqua Institution, and made his living as writer and editor of the literary weekly The Continent until it failed in 1884. He wrote many more novels and essays in the next two decades, many about the Lake Erie region to which he had located, including Button's Inn. One of his books explored social justice from a Christian perspective; this thought-provoking and controversial tome—Murvale Eastman: Christian Socialist—was published in 1890. What would become the Plessy v. Ferguson case began when a group of prominent black leaders in New Orleans organized a "Citizens' Committee" in September 1891 to challenge Louisiana's 1890 law intended "to promote the comfort of passengers" by requiring all state railway companies "to provide equal but separate accommodations for the white and colored races, by providing separate coaches or compartments" on their passenger trains. To assist them in their challenge, this group retained the legal services of "Judge Tourgée," as he was popularly known. Perhaps the nation's most outspoken white Radical on the "race question" in the late 1880s and 1890s, Tourgée had called for resistance to the Louisiana law in his widely read newspaper column, "A Bystander's Notes," which, though written for the Chicago Republican (later known as the Chicago Daily Inter Ocean and after 1872 known as the Chicago Record-Herald), was syndicated in many newspapers across the country. Largely as a consequence of this column, "Judge Tourgée" had become well known in the black press for his bold denunciations of lynching, segregation, disfranchisement, white supremacy, and scientific racism, and he was the New Orleans Citizens' Committee's first choice to lead their legal challenge to the new Louisiana segregation law. Before the case began, Tourgee played a strategic role, for instance suggesting a light-skinned person to challenge the law. Dan Desdunes, the son of prominent Citizens Committee leader Rodolphe Desdunes was initially selected, but his case was thrown out because he boarded an inter-state train and it was decided state law did not apply. Homer Plessy was then selected and he was arrested after boarding an intrastate train. Tourgée, who was lead attorney for Homer Plessy, first deployed the term "color blindness" in his briefs in the Plessy case, and had used it on several prior occasions on behalf of the struggle for civil rights. Indeed, Tourgee's first use of "color blindness" as a legal metaphor came decades before while serving as a Superior Court judge in North Carolina. In his dissent in Plessy, Justice John Marshall Harlan borrowed the metaphor of "color blindness" from Tourgée’s legal brief. In the wake of an 1892 lynching in Memphis known as the Peoples Grocery lynching, anti-lynching activist Ida B. Wells asked Tourgee to represent her in a libel case against Memphis Commercial Tourgee, having largely retired from law (with the exception of his work with the New Orleans "Citizens' Committee") refused. Tourgee recommended Wells contact his friend, Ferdinand Lee Barnett, and Barnett agreed to take the case. This may have been Barnett's introduction to Wells, whom he would marry two years later. Barnett came to agree with the advise of Tourgee that the case could not be won as a black woman would never win such a case heard by a white, male jury, and the case was dropped. In 1897, following Tourgée's involvement in the Plessy case, President William McKinley appointed him U.S. consul to France, and he lived and served there in Bordeaux until his death in early 1905. He became gravely ill for several months, but then appeared to rebound. The recovery was only momentary, however, and he succumbed to acute uremia, probably resulting from one of his Civil War wounds. Tourgée's ashes were interred in Mayville, New York, at the Mayville Cemetery and are commemorated by a 12-foot granite obelisk inscribed thus: I pray thee then Write me as one that loves his fellow-man. 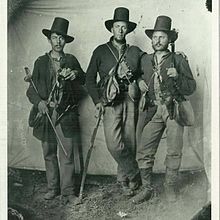 About 1900, he joined the Military Order of the Loyal Legion of the United States, an influential veterans' organization composed of men who had served in the Union Army in the Civil War, and had been at some point commissioned officers. He was assigned Companion No. 13949. On September 5, 1880 Tourgée met his wife in court to settle a financial dispute. Tourgée won, and his wife was issued a $35 fine and sentenced to jail. There is no evidence that she actually served any time, and their marriage did not suffer any lasting harm by this obscure incident. In fact, one biographer of Tourgée, after mentioning that they met as students at Kingsville Academy, made the following observation: "It was a case of love at first sight, on Tourgee's part at least; for when he first saw her, he confidentially remarked to a friend, 'I'm going to marry that girl,' and after an engagement of five years he did so. The remark he made to her on his death bed, 'Emma, you have been the one perfect wife,' was but little exaggerated, as succeeding events [in his life showed]." ^ Gross, Theodore. Albion W. Tourgée. Twayne Publishers, Inc., 1963: 13. ^ Olsen, A Carpetbagger's Crusade. ^ Toth, Margaret, Albion Winegar Tourgée, '62, University of Rochester Library Bulletin, Vol. III, Spring 1953, No. 3. ^ Michael Kent Curtis, “Tourgée, Albion Winegar,” American National Biography Online, (2000), accessed September 1, 2011, http://www.anb.org/articles/04/04-00994.html. ^ Gross, Theodore. Albion W. Tourgée. Twayne Publishers, Inc., 1963: 35. ^ "The Continent Weekly Magazine". The Week : a Canadian journal of politics, literature, science and arts. 1 (1): 15. 6 Dec 1883. Retrieved 20 April 2013. ^ Karcher, Carolyn L. A Refugee from His Race: Albion W. Tourgée and His Fight Against White Supremacy. UNC Press Books, 2016. ^ Crocker, Kathleen A., Chautauqua County Lawyers Oppose Segregation: The Robert H. Jackson-Albion W. Tourgee Connection, Jamestown Post-Journal, Family Section, April 24, 2004. Quotation from Abou ben Adhem, by Leigh Hunt. ^ Roy, Dibble (1921). Ablion W. Tourgée. New York: Lemcke & Buechner. p. 18. Mark Elliott, Color-Blind Justice: Albion Tourgée and the Quest for Racial Equality from the Civil War to Plessy v. Ferguson (2006). "Albion W. Tourgée Dead. ", The New York Times, May 22, 1905, p. 7. A Fool's Errand. By One of the Fools. This page was last edited on 11 March 2019, at 14:41 (UTC).